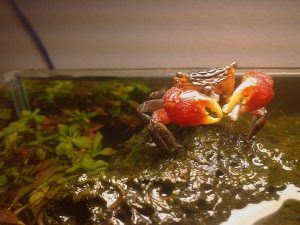 The Red Claw Crab, also called the Thai Crab, Mini Crab, or simply, the Red Crab, is a species of non-insect arthropods found in the waters of Indo-Pacific Asia. 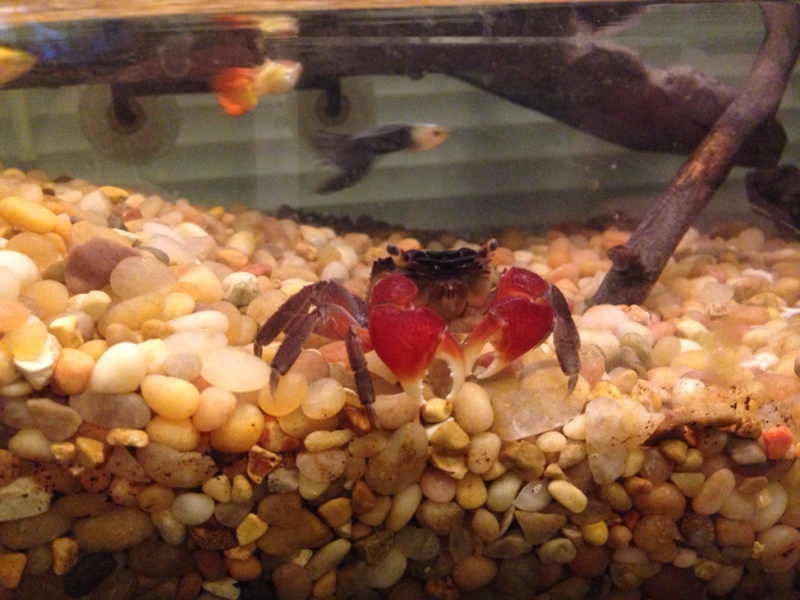 Known for its small size and vibrant red coloration, this crustacean is a favorite item in the world pet trade. Size: They can have a leg span length of up to 4″ (10 cm). Carapace: The length of the flat carapace area is generally not more than 2″ (5 cm). Body Color: The entire body is mostly red to flaming orange, with brown patterns all over the shell. Limbs: The number of legs is eight, and the two characteristic claws that they use like pincers. Eyes: They have compound eyes that protrude out from their carapace, next to the mouth, like most other crab species. Sexual Dimorphism: The males of the species are usually larger, with brighter red claws and vibrantly colored, unlike their female counterparts that are smaller in size and have darker claws. Also, the flap in the underside of the male is narrower, while in the females, it is more extensive. 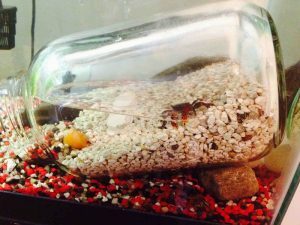 Currently, there is no data available on the average or maximum lifespan for this species in the wild, but can live for two years, and some specimens for even more than three years in captivity (aquarium tank), if appropriately cared. 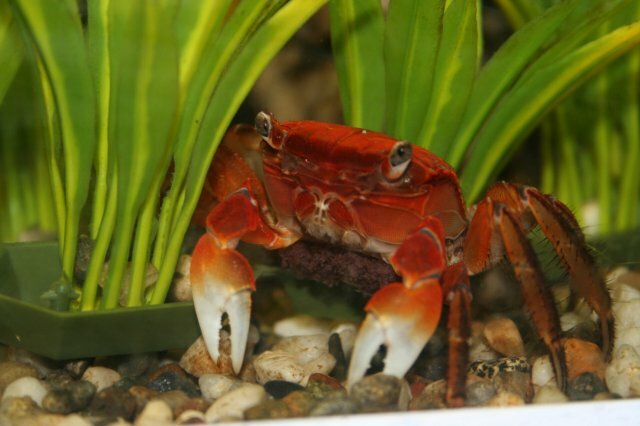 The range of this crab is the Indo-Pacific region between Zanzibar to Japan and Fiji Islands; in the South China Sea from Hong Kong to Singapore. Biologists have not defined any regional subspecies of these arthropods. The natural habitat of these red crabs is in the shallow tropical waters of the mudflats and the mangrove swamps in Asia, usually in the estuaries where the rivers flow into the sea, mixing salt and fresh water. Red claw crabs are nocturnal and are extremely good at escaping from its potential enemies. They are excellent climbers and can walk or run through the underwater surfaces very fast. These crabs are also aggressive, and will not tolerate other species to come close to them. 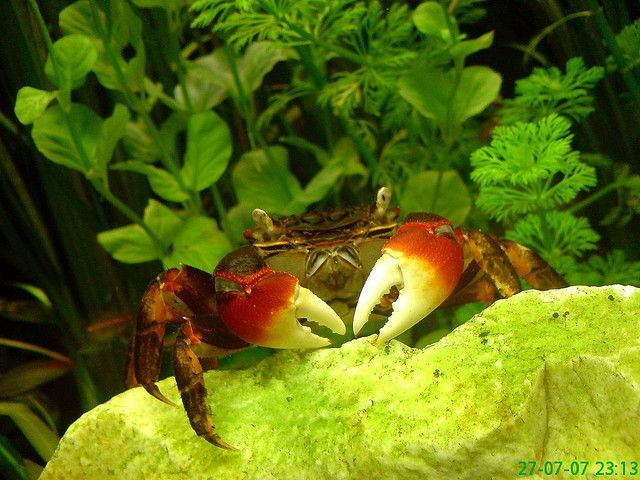 In fact, being territorial, a male crab will most frequently attack another male, especially when it is the mating season. For defense purposes, they use the pincers or claws to induce a moderately strong ‘pinch’ to their enemies. Though these are aquatic animals, they do need air, and hence crawl up to high surfaces above the water line for the purpose of breathing. 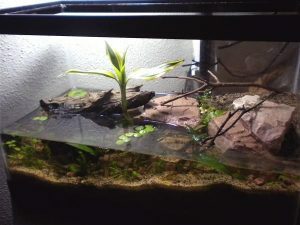 This behavior holds good even in the case of aquarium setups. Red claw crabs can hunt actively but are not strict carnivores. These crabs create small, tight-fitting caves under the submerged rocks and wood logs, where they will hurriedly take refuge, if threatened. The crab will also stay burrowed for a few days during molting. These are omnivorous creatures, feeding on both plant and animal matters. The animal foods they consume include mollusks, aquatic or marine worms, crustaceans, and other marine invertebrates like zooplankton. The plant foods include macroalgae, algae, and phytoplankton. They also consume fungus, detritus, and microbes. 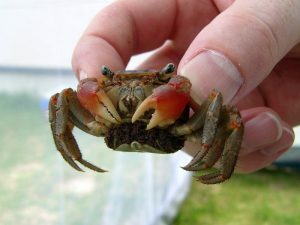 The mating of these crabs has not yet been clear; however, the process of mating can occur around the year, seasonally. The average brood per year is 3.5, with the females reproducing for 1 to 2 months per clutch, taking periods of short resting in between. The baby crabs begin their life cycle from the larval stage, as they hatch out of the eggs. This process is almost impossible in a man-made tank setup. They grow up feeding algae and other microorganisms. The young crabs do not get parental care during the process of growing up. The exoskeleton (carapace) of the creature saves them from predators. The structure begins growing in the prime of their life, and the crustacean gets a new shell after every molting. Quite like the lizards tail, these crabs have the ability to shed one of its limbs, in case it gets stuck or else, attacked by some predator. They can effectively move on without the leg, and a new leg also grows to replace the missing one. Their patterned coloration in red/orange and brown is a paradox to help them camouflage themselves in the sand. 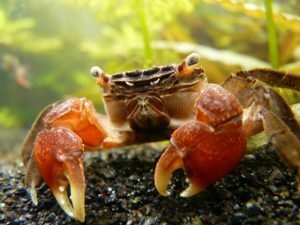 The crab uses the fine hairs on the legs and claws for tasting the sand and sensing its biome. The primary predators of these creatures are many, viz., black croaker, black and yellow rockfish, kelp rockfish, copper rockfish, sculpins, lingcod, sea otter, cabezon, and East Pacific red octopus. Though they often reach the land to get air, they dehydrate very quickly, and hence, can’t stay on land surfaces for long. 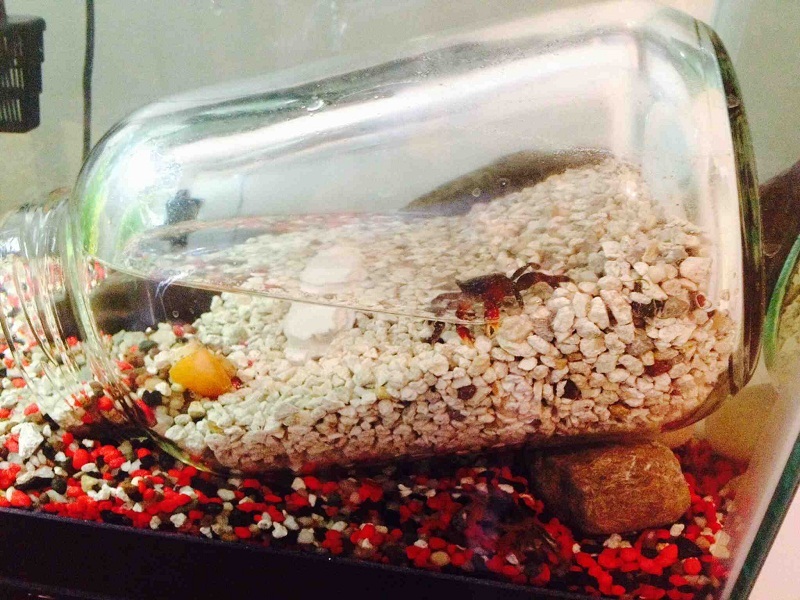 Many aquarists have reported that their pet crabs have been getting used to them, losing fear after a while. 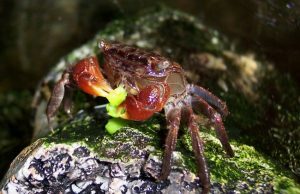 The crab eats its own discarded exoskeleton after molting, which provides it with calcium. The pinch the red claw crab is hard enough to startle a human.